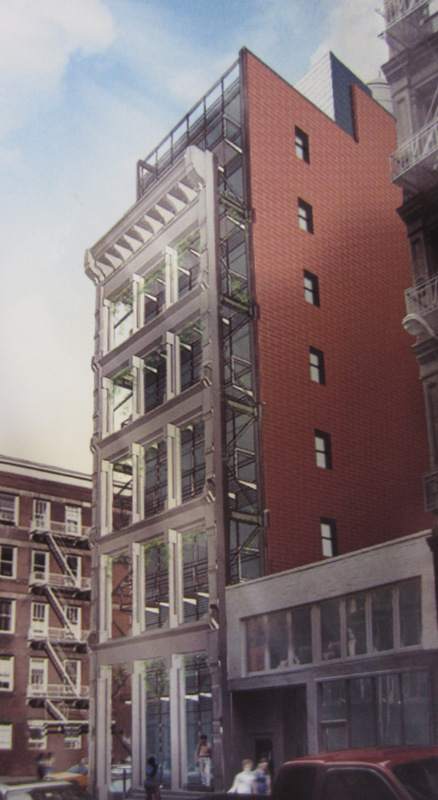 Rendering of proposed building at 74 Grand Street. Original 19th-century cast-iron facade preserved and stored as part of prior demolition application. 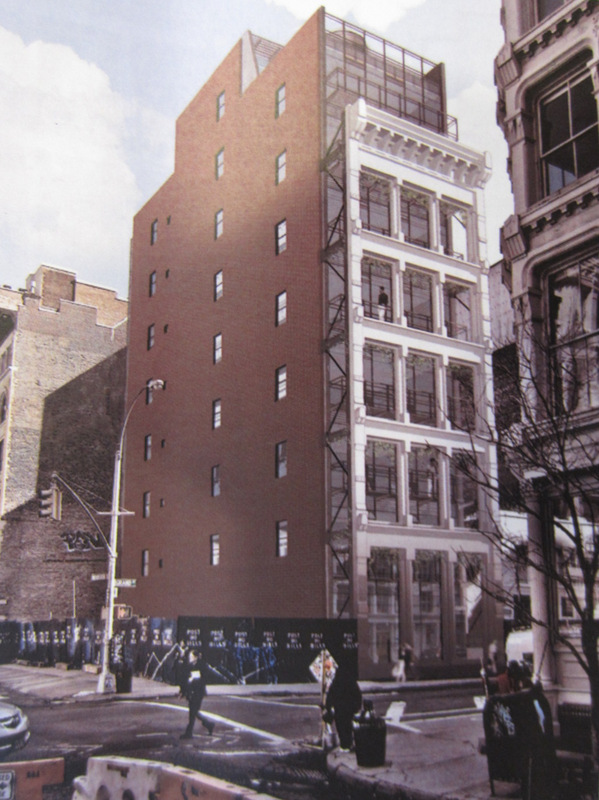 On March 19, 2013, the Landmarks Preservation Commission considered an application by SoHo Equities to construct a new building at 74 Grand Street in the SoHo-Cast Iron Historic District. The currently vacant lot previously hosted an 1886 neo-Grec store-and-loft building, which was demolished in 2010 because it was structurally unsound. Landmarks granted a certificate of appropriateness for the demolition in 2009 after the owners agreed to disassemble the facade and store its cast-iron components securely, so that the retained elements would be incorporated into any future structure at the site. Attorney Caroline Harris of Goldman Harris represented the applicants and explained that the historic structure was occupied by a co-op. After an adjoined property was excavated without proper underpinning, the Department of Buildings ordered the occupants to vacate the co-op, and then ordered the building’s demolition. She said the fabric salvaged from the original building was protected and stored in a New Jersey storage facility. The old facade would be reutilized on the new building, but it would be impossible to construct a replica of the original structure because the original structure was not in compliance with the Building Code. Harris said the proposal would integrate the historic material into the new building in a way that would “recognize that something happened.” She further claimed the design was “sensitive and thoughtful in integrating the history and the recent past” by putting a gap between the preserved facade and the rest of the new building. She added that “the design [was] consistent with surrounding buildings,” and was supported by numerous architects whose letters were submitted to Landmarks. The project will require waivers for ground floor commercial use and residential use on the upper stories, height and setback, as well as for additional floor area. He said the new building would stand about eight feet behind the restored facade, “to achieve a reasonable measure of efficiency” and “mediate dimensions” between the old and the new structures. The distance would be filled by “green space open from ground to sky, with balconies for residents,” and the facade would be attached to the new building by a steel armature. He said the historic facade “remains the primary architectural feature of this new building.” He described the new building behind the facade as “modest, and honestly contemporary,” with a simple glass and metal facade that would not “compete” with the historic cast iron. He said the proposal “tells the story of the undermining and loss of the original building.” The floor-to-floor height of the new structure would not match that of the facade, because of the ground floor courtyard, ingress, and egress requirements, and because floor-to-ceiling heights would differ from the original building. The side walls would be clad in red brick, and Levine said he expected the empty adjacent lot to be filled in the near future. He claimed the penthouse would fit in with rooftop bulkheads and other roof structures common to the district. Rendering of 74 Grand Street proposal. Chair Robert B. Tierney asked the applicants to consider reducing the height of the proposal, as well as to further refine the design, and to return to the Commission with a revised proposal at a future public meeting. LPC: 74 Grand Street, Manhattan (14-0893) (Mar. 19, 2013) (Architect: Bone/Levine Architects).